If you need to rent a car in Halifax, VroomVroomVroom can help you compare rates from trusted suppliers such as Budget, Enterprise, Alamo, Avis, Hertz, Thrifty and Dollar. Explore Nova Scotia in a car rental and see all of the best sights. Just fill in the search form above with complete information to find your ideal rental car. Halifax is the waterfront capital of Nova Scotia, and the largest city in the province. It is has been ranked among the best places to live in Canada. Halifax has an interesting maritime history and still features many nautical attractions like the oldest running saltwater ferry service in North America. Why book a rental car in Halifax with VroomVroomVroom? Here are a few outstanding reasons to book with us. Great rates: We have negotiated with our car rental partners so we can provide the best price. Read our Price Promise for more details. Easy rental process: You can reserve a rental car in two minutes with our user-friendly booking system. Flexibility: There is a lot to see in Halifax and Nova Scotia. A rental car will give you the freedom to see all of the museums, parks, historical sites, gardens and farms at your own pace. Wide selection of cars: Since we compare deals from various rental car companies, you can easily find the perfect ride for your next trip. Trusted since 2001. If you have any questions about car rentals in Halifax, don't hesitate to contact us and one of our friendly customer care experts will be happy to help you. You may also leave us a message on Facebook and Twitter. The best months to visit Halifax to take full advantage of the pleasant weather and mild nights is during late spring (from March to May) and in summer (June to August). However, these months normally attract plenty of tourists, so expect higher hotel rates and huge crowds. If you want to skip the huge crowds and the high prices, visit Halifax from November to February. Although the weather will be cold, you can visit Nova Scotia's ski slopes and enjoy lower accommodation prices. Be aware that in spring there is an increased chance of rain in Nova Scotia. A rental car in Halifax will give you the opportunity to see some great sights, like Citadel Hill, the famous Halifax Town Clock, Fenwick Tower and the southern Victorian-style houses. Parking is plentiful in the city centre, and there are plenty of road signs to guide you. Make sure to plan your driving itinerary ahead of time if you are planning to see other destinations in Canada, as the travel times can be extensive. Also, take additional care during the winter months when there may be snow and ice on the road. Halifax is a magnificent city and certainly provides an amazing amount of things to do. There is so much to explore with your car rental that you have more than enough things to keep you entertained during your entire stay. Have some fun exploring the historical museums, fantastic gardens, visual landmarks, beautiful parks, and wonderful theaters with your car rental. Halifax is a great destination for both indoor and outdoor activities. 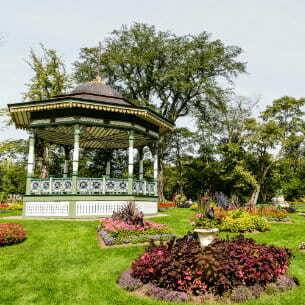 Halifax Public Gardens is a spectacular place in Halifax, noted for the incredible beauty which characterized it. The garden is Victorian-inspired and features numerous flowers, as well as walking paths. This is the perfect place to relax and admire the beauty of the gardens. Elements on Hollis is a great restaurant in Halifax, where you will be able to experience the Canadian cuisine. The food is excellent and spectacularly presented, as well as the service and the atmosphere. You will surely have an amazing dining experience here. Chives Canadian Bistro is another terrific restaurant in Halifax. The dining venue features expertly prepared local dishes which you will most certainly enjoy. Make sure that you also try the mouthwatering buttermilk biscuits, which give a nice touch to the menu. Maritime Museum of the Atlantic is a fantastic destination for marine history with their amazing collection of buoys, anchors, binnacles, model ships, the Titanic exhibit, and many others. Kids can enjoy time there exploring the various displays, as well as have fun with Lego City. Grab your rental car and head out to some adventurous, creative fun. Point Pleasant Park is a nice, friendly outdoor park to have a wonderful, relaxing time. Drive your car rental over and enjoy picnicking to the fantastic views of the ocean, as well as enjoy taking a hike through more than 180 acres of forest. Several paths add variety to walking, hiking, and jogging. Discovery Centre is a hands-on experience with several exhibits in science, as well as daily shows and movies to entertain while educating. Kids can enjoy the hands-on fun with thousands of Lego blocks, as well as building a block bridge within the Arch Bridge location. There is so much fun here that your rental car may enjoy it. Lawrencetown Beach is a wonderful getaway destination with salt purified air and surfing fun. This hot spot for surfers also has plenty of sand land to just kick back and relax. Park the car rental and set out for some outdoor enjoyment. The long stretch also allows for a lovely beach walk for those who prefer to keep moving. Downtown Halifax is the entertainment and tourism hub of the municipality, featuring business offices, historic areas, museums, shopping facilities, restaurants, theaters, and nightlife options. Pier 21, the Maritime Museum of the Atlantic and the Art Gallery of Nova Scotia are the main cultural and art institutions here. Shopping malls include Scotia Square, Barrington Place Shops, and Maritime Mall. Neptune Theater and the Shakespeare by the Sea theater are also located here. The most popular events in Halifax are being held here as well, including the Nova Scotia International Tattoo and the Atlantic Film Festival. The major culture center of Halifax Regional Municipality is an urban area populated by college graduates who support and frequent a variety of theatres, art galleries, museums and performance venues. These include the Neptune Theatre,Halifax Pop Explosion, the Art Gallery of Nova Scotia andSymphony Nova Scotia. The HRM also hosts the Atlantic Film Festival, Greekfestand Shakespeare by the Sea. Would you enjoy seeing the Natural Beauty that is Nova Scotia? In Halifax, you also have plenty of chances to enjoy the outdoors, including beaches on the Atlantic Ocean and on the lakes, as well as parks throughout the city and its surrounding countryside. The rental car you book using VroomVroomVroom will give you access to all of these beautiful natural wonders, and you'll be able to enjoy them whenever you want! The biggest festival in Halifax is The Royal Nova Scotia International Tattoo, a week-long annual event with educational workshops and a daily world-class show lasting over two hours, featuring fast-paced acts guaranteed to entertain your whole family. If you're in Halifax in summertime, you can drive your rental car over to the Tattoo. With bagpipes, highland dancers, acrobats, modern music, and contemporary dancers, it's the world's biggest annual indoor show! Held annually, the next one will occur from June 26 - July 2, 2018. Alamo Halifax Cruise Ship - 1161 Hollis Street , Halifax, NS. Avis Avis Kempt Road - 3275 Kempt Road, Halifax, NS. Avis Avis - Grafton St. - 1717 Grafton Street, Halifax, NS. Budget Halifax - 3275 Kempt Road, Halifax, NS. Budget Halifax - 1554 Hollis Street, Metropark, Halifax, NS. Enterprise Halifax Kempt Road - 3387 Kempt Rd. , Halifax, NS. Enterprise Scotia Square Halifax - 2000 Barrington St , Halifax, NS. Enterprise Via Rail Halifax - 1161 Hollis St , Halifax, NS. Thrifty HALIFAX - WESTIN HOTEL, NS, CA TLE - 1181 HOLLIS STREET, HALIFAX, NS. Hertz Halifax Marriott Hotel - 1919 Upper Water St, Halifax, NS.